Whitworth University has again been designated one of the best colleges and universities in the West in a recent college guide published by The Princeton Review. 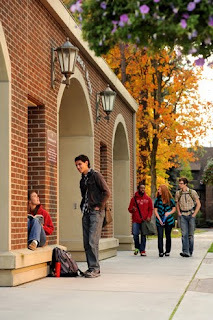 The education services company ranked Whitworth among 121 institutions it recommends in the "Best in the West" section of its website, "2012 Best Colleges: Region by Region," which posted this month on http://www.princetonreview.com/. "We're pleased to recommend Whitworth University to users of our site as one of the best schools [at which] to earn their undergraduate degree," says Robert Franek, The Princeton Review's senior vice president of publishing. "We chose Whitworth and the other terrific institutions we name as 'regional best' colleges mainly for their excellent academic programs." The Princeton Review chooses schools based on institutional data it collects from several hundred schools in each region, on visits to schools, and on the opinions of independent and high school-based college advisors. It also takes into account students' reports about their campus experiences. Only schools that permit The Princeton Review to survey their students independently are eligible to be considered for the regional "best" lists. "It's great to be recognized in Princeton Review's 'Best in the West' listing, because the recognition is based in large part on ratings by our own students," says Greg Orwig, Whitworth's vice president for admissions and financial aid. "We are thrilled when our students report that they are satisfied with Whitworth's commitment to academic excellence, faith-learning integration, outstanding facilities and grounds, approachable faculty and extensive study-abroad opportunities. It's a welcome bonus when that student satisfaction translates into positive rankings and media coverage." The Princeton Review doesn't rank the colleges in its "2012 Best Colleges: Region by Region" website section. The 121 colleges that The Princeton Review chose for its "Best in the West" list are located in 15 states: Alaska, Arizona, California, Colorado, Hawaii, Idaho, Montana, Nevada, New Mexico, Oklahoma, Oregon, Texas, Utah, Washington, and Wyoming. The Princeton Review also designated 220 colleges in the Northeast, 153 in the Midwest, and 135 in the Southeast as best in their locales. The 629 colleges named "regional bests" constitute only about 25 percent of the nation's 2,500 four-year colleges. The survey for this project asks students to rate their own schools on several issues -- from the accessibility of their professors to the quality of the campus food -- and to answer questions about themselves, their fellow students, and their campus life. Comments from surveyed students pepper each Princeton Review college profile. In the profile on Whitworth, students said the university offers a "strong liberal arts education" in a "spectacular setting" and a "strong emphasis on Christian beliefs." Students reported that the one-month January term features "amazing opportunities to travel abroad" and said that Whitworth has "very approachable professors who are here to teach" and who "really invest in relationships with the students." Students also describe Whitworth as having an "intimate campus" with a "caring, home-like atmosphere." Princeton Review (http://www.princetonreview.com/) is known for its tutoring and classroom test-preparation courses, books, and college and graduate school admission services. Its corporate headquarters is in Framingham, Mass., and its editorial offices are in New York City. It is not affiliated with Princeton University and it is not a magazine. Media Contacts for The Princeton Review: Joseph Iovino, 888-865-7737 ext. 5678(JIovino@review.com) or Jeanne Krier, (212) 539-1350 (Jeanne@Jeannekrier.com).